Filling: Place all ingredients except butter in a large bowl, combine with hands until well mixed. Place in a baking dish and put little pieces of the butter scattered on top. Bake in the oven for approx 25 mins. Meanwhile, to make cobbler batter: Put all dry ingredients into the bowl of a processor and pulse until combined. Add unsalted butter and process for 30 secs until mixture resembles breadcrumbs. Transfer mixture to a large bowl. Stir in buttermilk and vanilla and mix with a spoon until just combined. 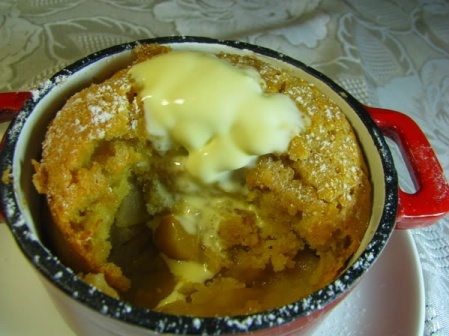 Remove apples from the oven and either pour cobbler batter on top to make one big one, or put apple mixture into greased individual, 1 cup capacity pots, spoon batter on top, sprinkle with extra raw sugar and place in the oven. Bake for approx 25 – 30 mins or until well risen and golden. 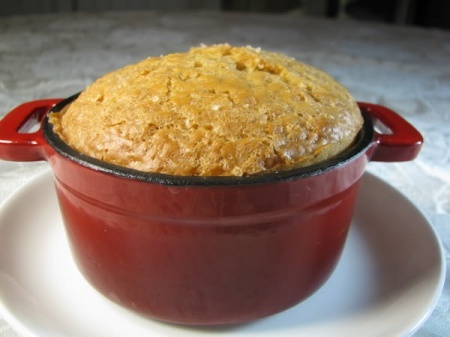 Remove from oven, sprinkle with icing sugar if desired and serve with cream or ice cream.